POSTED February 21, 2019 10:39 a.m. MINERAL POINT — After Wednesday WIAA Division 3 Team Sectional championship, the Fennimore wrestling team continued its school record-breaking success Saturday at the WIAA Division 3 Mineral Point Individual Sectional. 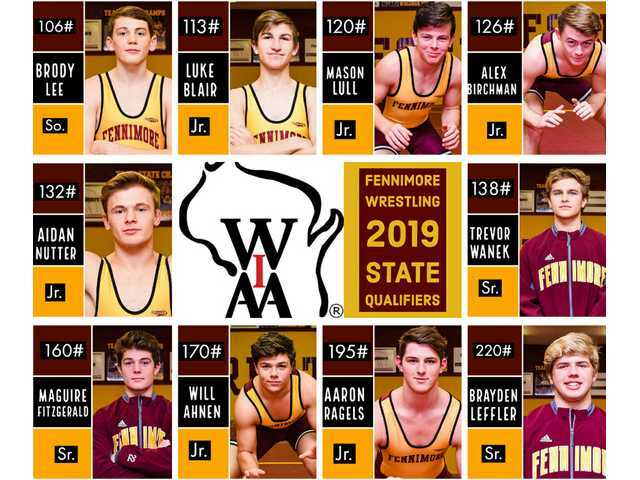 All 10 Fennimore sectional qualifiers reached the finals at the loaded sectional, and all 10 advance to this weekend’s WIAA D3 Individual State Tournament that begins Thursday night at 7 p.m. at the Kohl Center in Madison. The 10 individual state qualifiers is a school record and the most by any team in Division 3 this year. Junior Luke Blair (113 pounds), junior Mason Lull (120), junior Alex Birchman (126), junior Aidan Nutter (132) and junior Will Ahnen (170) each won individual sectional titles and will have a first-round bye Thursday night. All five will open their 2019 state tournaments with quarterfinal matches Friday morning. Sophomore Brody Lee (106), senior Trevor Wanek (138), senior Maguire Fitzgerald (160), junior Aaron Ragels (195) and senior Bryden Lefler (220) each finished second in their respective weight classes. Fennimore’s sectional runners-up will begin the 2019 D3 state tournament Thursday night with preliminary matches. The Division 2 and 3 first round session begins at 7 p.m. at 106 pounds. Blair (31–7) reached the 113-pound championship match with an injury default victory over Riverdale’s Justice Dilley. He then defeated Lancaster’s Carter Lull (34–10) 2–0 in the finals with a takedown in overtime to earn his first state berth. Lull (35–12) will be making his third straight state appearance after winning the 120-pound title with a 6–3 decision over Joseph Penchi of La Crosse Aquinas. Birchman (31–11) finally got his man and in the process, earn his third trip to the state tournament. After narrowing the score in consecutive losses to Mineral Point senior Danny Pittz in the past two weeks (at conference and regionals), Birchman defeated Pittz (35–4) 6–2 in Saturday’s 126-pound sectional final. “It was great that Alex Birchman finally got by Pittz,” said Steldt. “Pittz is a great competitor and it is actually because of him that Alex has improved so much. We knew we had to beat one of the best in the state so we trained to do so. This created a great and memorable match for everyone involved. Nutter (37–7) is also a three-time state qualifier after winning the 132-pound title with back-to-back first-period pins and a 6–3 championship victory over Mineral Point’s Caden Carey (34–6). Ahnen (35–9) earned his second straight state berth by winning the 170-pound title with a dominating 55-second pin of Cambridge’s Caden Grieser (24–15) in the finals. Lee (27–11) finished second at 106 after a 7–2 championship loss to top-ranked Remington Bontreger (45–1). Lee is a two-time state qualifier. Wanek (30–14), who won the 126-pound D3 state title two years ago as a sophomore, became a four-time state qualifier after finishing second at 138 on Saturday. Wanek finished second after a dramatic 9–7 overtime loss to Darlington/Black Hawk’s Kolbe Ubersox (36–4) in the finals. Fitzgerald (36–6) became a three-time state qualifier with a second-place finish at 160. He suffered a 5–4 loss to Ithaca/Weston’s Colton Clary in the finals. Ragels (34–10) went 2–1 at sectionals to finish second to Lancster’s Caden Straka (39–6) to earn his first trip to state. Straka edge Ragels 2–1 in their title bout. Leffler (24–11) is also a first-time state qualifier at 285. His only loss on Saturday was a first-period pin to top-ranked senior Drew Hennessey (37–1) of Iowa–Grant/Highland. Top 10 team scores — 1.Fennimore 195, 2.Mineral Point 101, 3.Lancaster 99.5, 4.Ithaca/Weston 62, 5.Darlington/Black Hawk 45, 6.La Crosse Aquinas 43.5, 7.Riverdale 39, 8.Pecatonica/Argyle 34, 9.North Crawford/Seneca 27.5, 10.De Soto 26. 106 — Brody Lee (27-11) placed 2nd and scored 16.0 team points. 113 — Luke Blair (31-7) placed 1st and scored 22.0 team points. 120 — Mason Lull (35-12) placed 1st and scored 20.0 team points. 126 — Alex Birchman (31-11) placed 1st and scored 20.0 team points. 132 — Aidan Nutter (37-7) placed 1st and scored 22.0 team points. 138 — Trevor Wanek (30-14) placed 2nd and scored 20.0 team points. 160 — Maguire Fitzgerald (36-6) placed 2nd and scored 16.0 team points. 170 — Will Ahnen (35-9) placed 1st and scored 23.0 team points. 195 — Aaron Ragels (34-10) placed 2nd and scored 18.0 team points. 220 — Brayden Leffler (24-11) placed 2nd and scored 18.0 team points.